The TULA Arms Plant was founded in Russia by Peter the Great in 1712. It has been a huge manufacturer in the cartridge world since its founding and it still is today. The TULA plant also builds various types of firearms for the military and sportsman. In addition to the firearms, TULA also manufactures different ammunition types for the most common Russian firearms known worldwide. We recognize them for their tough, steel cased ammo that is priced affordably and reliably, and commonly run through AK platforms all over the USA. 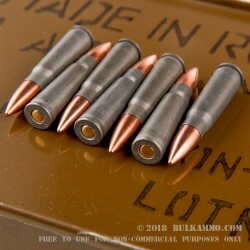 This 7.62x39 Tulammo ammunition is loaded with a Full Metal Jacketed 122 grain, one-piece, lead core bullet. Those bullets are loaded into a thick-walled, tough, non-corrosive Berdan primed, heavy gauge, steel case with a polymer coating. They have a maximum case pressure rated at 39,800 PSI, or pounds per square inch. The muzzle velocity of these rounds is 2,396-feet per second of heavy duty, Full Metal Jacket, 7.62x39 strength. These rounds come in the instantly recognized "Spam Can" full of Tulammo 20 round boxes. Each Spam Can comes completely sealed and includes a can opener so getting into the can and getting to your ammo is easier. Stock up your safe with this Russian ammo juggernaut and your next range day will be awesome. Get yours today. Get your AK-47 out, it’s time to hit the range! cheap and a simple way for for those that plan long term storage. Same good Ammo at a better price. I enjoyed shooting this ammo.and had no problems. I am about to buy another container in a few days. Customer service answered all my questions in a timely and polite manner. Q: Is the ammo in the can loose or is packed like tulamo 20 round with paper wrapping or other packing material? Also what temperature do you suggest for storage? 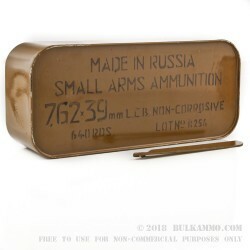 A: The Tula 7.62x39 ammo in this can is packed in boxes of 20 rounds each. Storing the can in a cool, dry place is recommended for best long term results. Q: Is this ammo non-corrosive? A: Yes, this Tula 7.62x39 ammo is non-corrosive. Q: What are the dimensions of the spam can? A: Sealed spam cans of 7.62x39 ammo are approximately 14" x 6" x 4". Q: Can you reload the used steel casings after firing? A: No, the steel cases are effectively not reloadable. A: These are sold individually, not as a pair in a wooden crate like the surplus ammo. Q: Is this container waterproof? I would like to store it in a basement where the floor can be moist from time to time. A: While this container will keep out moisture for a reasonable period of time, it is a bad idea to store ammo where it might encounter water. Q: I was recently told 7.62x39 ammo can come in actual bullet diameters of either .308 or .310. Is this true? If this is true, which bullet diameter is the Tula? A: The proper bullet diameter for 7.62x39 ammo as specified by both CIP (European standards organization) and SAAMI (American standards organization) is .311". This Tula ammo is loaded with properly sized projectiles. You will occasionally find 7.62x39 rifles with .308 bores and 7.62x39 ammo with .308 projectiles, but this is quite uncommon. Q: I know that most of the bulk, eastern manufactured 7.62 x 39 is NOT re-loadable... Is this one re-loadable... of course, at this price it is a great deal even if it is a throw away shell!! I am going to get a couple of tins either way. Oh yeah, also, how does it compare in accuracy with the Wolf brand? A: These Tula steel cases are not reloadable. Accuracy is comparable to Wolf brand ammo. Q: I shoot a Ruger Mini-30. What impact would this ammo have on my rifle? I normally only feed it Winchester or higher grade ammunition. I've always heard that the Russian ammo is dirty and will foul my weapon. Also, are the cartridges "lacquered"? I've heard that it's really the lacquer that fouls the chamber. Finally, if the bullet is steel does that have any adverse impact on the rifling in the barrel? thanks! A: Any ammo will foul a weapon if it is shot enough. The Mini-30 is quite reliable and fouling should not be an issue with it. These cases have a polymer coating which does not melt under high heat and cause any problems with the chamber. 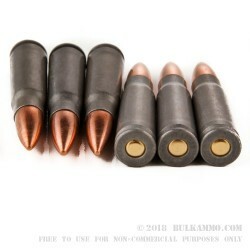 Also, the bullet has a bimetal jacket - the outer layer is copper. Your Mini-30 most likely has a hammer forged barrel, which is exceptionally durable, and the outer copper layer of these bullets is much softer than the steel of your barrel. They will not have any great impact on the rifling of your barrel. Q: How long will this last if stored in a cool dry place? A: Ammunition packaged in these tins, stored properly in a cool, dry place as you mentioned, has been known to last for decades. Q: Is there a shelf life. and what is the best way to store this ammo? A: If stored properly in a cool, dry location, this ammo will last for many years. Q: Is there a performance difference between steel case and brass case ammo? A: In firearms designed to shoot steel cased ammo, such as an SKS or AK-47, there will be no noticeable difference in performance. Firearms designed to shoot brass cased ammo may occasionally have failures to extract steel cases on extremely rare occasions. Q: What if any is the major difference between Russian and domestic amunition? A: Russians are the experts when it comes to steel cased ammo, and even Hornady uses Russian-made steel cases for its steel cased ammo. US-made ammo is loaded with brass cases, which are reloadable, but also more expensive. Q: Do you know if the bullet is steel core? A: The bullet has a lead core with a bimetal (steel/copper) jacket. Q: What does L.C.B. Stand for on the can? A: LCB stands for Lead Core Bullet. Q: What are the dimensions and weight of the spam can w/ammo inside? A: The spam cans of 7.62x39 ammo are approximately 14" long, 6" wide, and 4" high. Weight is approximately 27lbs. Q: I was once told that 7.62+39 ammo from foreign suppliers came loaded with a .311 diameter bullet while domestic manufacturers load the same with .308. Is this true and if so is there an advantage to one or the other? A: The proper projectile diameter for 7.62x39 ammo is .311", and the vast majority of ammo in this caliber (including domestically manufactured 7.62x39 ammo) is loaded with that diameter bullet (.310-.311"). Some very early runs of the Ruger Mini-30 were made with a .308 bore diameter, but newer Rugers and almost all other known 7.62x39 platforms are .311". An exception is the Century Arms VZ2008, which has a .308" bore. The practical differences are small and it is not likely to result in catastrophic failure if a .311" diameter projectile was fired through a .308" bore. However, it might be worthwhile to determine the bore diameter of your rifle - either by "slugging" the bore (a gunsmith can do that), or contacting the manufacturer and providing them with the serial number of your weapon. Q: Does this ammo have a steel core. I have an out door range that will not allow steel core ammo as it has potential to start wildfire. A: This ammo does not have a steel core. However, it does have a bimetal jacket, which is composed of steel and copper. You should check with your range to see if they allow bimetal jackets. Q: Is the 122 grain bullet a good choice for accuracy? A: From a bulk ammo standpoint, this ammo will be as good as any other when it comes to accuracy. Some European ammo manufacturers make match 7.62x39, but it is very expensive in comparison to this Tula 7.62x39 ammo. Q: I'm wondering how smoothly this will cycle in my Norinco SKS? A: Norinco SKSs are great weapons, and this Tula 7.62x39 ammo would be a good choice for one. I think you will find that it is very smooth shooting. Q: How does Tula compare with wolf in regards to residue/gunk build-up. Dirtier? Cleaner? A: Tula is comparable to Wolf in terms of powder residue and/or carbon after shooting. Q: Is this sealed AK-47 ammo your best bet for long term storage? I'm looking to store some ammo and this looks like a good way to do it. Is it filled with an oil or just prevents air from coming in? A: Yes, this sealed tin of Tula 7.62x39mm is the best choice for long term storage. The sealed steel "tin" prevents air and moisture from entering the space inside. However, it is not filled with oil, because submerging ammunition in oil for long periods of time will render it useless. Q: i regularly shoot wolf, bear, and other off brand ammo...is this what this is, or is it a better round? A: This Tula ammo is similar to Wolf and Brown Bear (Barnaul) ammo. Q: How long could this be stored before it starts becoming unsafe to use? A: If protected from moisture and extreme temperatures, unsealed tins of steel case ammunition from Russia are well known to be perfectly safe to use, as well as completely reliable, for several decades. Q: do you know the manufacture date on this ammo? A: This Tula ammo is new. Q: Is this newly manufactured ammunition and if so, what would you expect the long term storage life to be while it is still sealed in the spam can? A: Yes, this is newly manufactured ammunition. Ammunition produced in Russia and stored properly in these cans has been known to last for decades. Q: Will corrosive ammo ruin my AK? A: This Tula 7.62x39 ammunition is new production ammunition, and is not corrosive. However, to answer your question, corrosive ammunition will not ruin your AK. Cleaning with soap and water is recommended if you shoot corrosive surplus ammunition. If you clean the rifle properly after shooting, nothing bad will happen to it. Q: How much does each spam can weigh? A: Just under 30 pounds. Q: Can this ammo can be left out in a barn open to cold and heat for long periods of time? A: Yes, but doing so might shorten the life of the ammunition if it was exposed to extreme hot or cold temperatures. A: Shipping will not be cheaper if you order two cases together, but it will be cheaper than shipping one case on two separate occasions or as part of two orders. Q: What are the dimensions and weight of the sealed container? A: The sealed tins of Tula 7.62x39 ammo weigh about 27lbs and are roughly 14"x6"x4". Q: Realistically how long will this can keep this ammo fresh and without defect? A: Military surplus ammo from the 1970s and 1980s - and earlier - stored in these tins have been found to still be perfectly reliable when opened 20, 30, or 40 years later. Q: Does this come with stripper clips, and or do you sell stripper clips? A: This ammo does not come with stripper clips and we do not offer them individually. Q: What is the long term affect of shooting steel cased ammo vs brass cased? Or is it a tradeoff of different attributes? It seems to me that the steel cased would be less prone to problems, but tougher on the feed ramps. And brass would be softer, less damaging, and reloadable. But maybe the steel cased protects the chamber from case problems. This might be a bigger deal in a fluted chamber like an HK33. What say you? A: A lot of brass 7.62x39 ammo is actually difficult to reload because Eastern Bloc countries used Berdan primers, which cannot be decapped as easily as Boxer primers. Also, some brass 7.62x39 - like the Yugoslavian ammo - is corrosive. This is non-corrosive ammo, which is definitely easier on firearms, and allows you to have a more relaxed cleaning regimen. The metal parts of your rifle that come in contact with the case (such as the feed ramps, ejector, and chamber) should be heat treated and hardened to a far higher hardness level than these mild steel cases. The bottom line is if the rifle was designed to shoot steel cased ammo, using that ammo should not be of any concern. Even if the rifle was designed for brass cases, there is very little to worry about when it comes to non-corrosive steel cased ammo. Q: Is this storage can re-sealable? A: No - when the can opener is used, the tin cannot be resealed by any practical means. Q: Do you only have this in fmj or do you have any hollow points? A: At this time, the Tula ammo in a tin is available only in FMJ. Q: Does this shipment come with any stripper clips? A: No, this ammo comes packaged in boxes of 20 rounds each, there are no stripper clips. Q: what year was manufactured? A: This Tula ammunition is newly manufactured, and is not surplus ammunition. Q: is ths ammo corrosive? A: This ammo is not corrosive. Q: Is it possible to reload the steel casing once the ammo is spent? A: No, these Tula cases cannot be reloaded. Q: I have a Ruger Mini 30 and wanted to find some cheaper ammo for target shooting. I have found that some ammo will of this caliber will not work with my gun. Are there any issues with using this ammo in my Mini 30? A: This ammo is designed for 7.62x39 rifles with a .310-311" bore. You should contact Ruger with the serial number of your Mini-30 and ask if it was one of the early models which had a .308 bore, or one of the newer models with a .310" bore. A: Yes, this is the same ammo, just in a more durable container. If you store it properly, this ammo can last for decades. Q: What is the stored shelf life of this ammo for long term storage? A: Similar ammo sealed in these tins has been found to be reliable even after 30 or more years have gone by. Q: Do we know a date when the ammo was produced/packaged? Any estimates on storage like when left sealed in the can, forever? A: This is new production ammo. Military surplus ammunition stored properly in identical cans is reliable even after many decades have passed. Q: On the Russian made 7.62x39 in the "tuna can" is there a way to determine the manufacture date on said ammo? Thanks! A: This is brand new production 7.62x39 ammo. Q: I'm not sure I understand the 'corrosive" question correcttly as I think it pertained to the primers. Are the primers corrosive to the rifling of the weapon? A: No, this Tula 7.62x39 ammunition is not corrosive and will not harm the rifling of your weapon. Q: I've been taught not to fire steel case ammo in my AR due to the potential to damage the extractor. Does that same logic extend to AK's or is the system robust enough to handle extensive use of steel case ammo? A: The mild steel cases used by Tula for these 7.62x39 cartridges will not cause damage to a rifle's chamber, extractor, or other parts. The AK-47 platform is, in fact, designed to shoot steel cased ammunition. Q: What is the best way to open this type of can if you do not have the opener / would a p38 can opener work? A: A special "spam can opener" is included, however, using a smaller can opener without the same length as the original would make it difficult. These cans were built to last. However, once you've opened it, you should have no difficulty accessing the ammunition in the future. Q: Does this ammo's bullet have steel core? i.e. will a magnet stick to the bullet it's self? A: No, this Tula 7.62x39 is not steel core ammunition. However, magnets may be attracted to the bullets because steel is used in the bi-metal jacket of the projectile. A: It is impossible to say exactly what other vendors have. This ammunition is manufactured in Russia by the Tula Cartridge Works. Q: Does this can come with the opener included? A: Yes, this 7.62x39mm spam can is shipped with a can opener to help open this rugged can. Q: Is this ammo corrosive? A: Tula's 7.62x39mm ammunition comes in a sealed metal spam can and is non-corrosive making it an ideal choice for long-term storage.